As expected, the last entry in this travel journey is rather late. I am only just emerging from recovery mode, with a proper Sabbath rest into my system to give me the energy to write again. Our last few days in Iqaluit were pretty quiet. Friday morning Bp. Darren took me around to a few places, but what I can share of that was mostly represented in the previous post. The afternoon and evening were marked by a proper blizzard – meaning visibility of 400 meters or less for 6+ hours. There were a couple times that I thought I heard thunder, but I realized it was just gusts of wind hitting the house. Saturday we mostly lounged around feeling miserable, and made our way over to the little church bookstore to buy an Inuktitut hymnal. 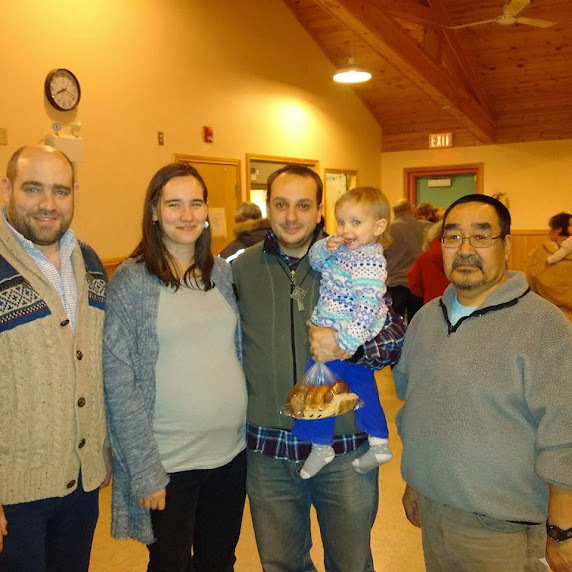 (Jonas had already gifted us an Inuktitut Bible.) But in the evening the vestry of the church threw us a lovely little send-off party in the parish hall. So many baked goods! So delicious! Must learn to make bannock like that. Bp. Darren, me, Jared & N, and Dean Jonas. Square pictures courtesy of Bp. Darren’s Blackberry – I brought the camera, but couldn’t bring myself to stop talking to people long enough to dig it out from under our coats. Her mama showed me how her amauti works, though of course N wanted nothing to do with it. New baby, you are going to be trained to love babywearing! Resistance is futile! But seriously, the send-off party was so sweet. It was so humbling to be so embraced by a new church family in such a short amount of time. Sunday morning got N a little more playtime with her new little friend A, one last coffee hour with our friends, and the chance to say short goodbyes during both morning services. Coffee hour takes place in the soup kitchen, if you were wondering what the dining side looks like. Just enough time to say goodbye at the second service, hop into an SUV with Jonas’s wife (a master craftswoman who I wish I’d gotten to spend more time with), give last hugs, choke down sandwiches, and file through security. The trip home was… an exercise in purgation. At least, “purgation” was the word that kept coming to mind every time we had to hurry up and wait somewhere: a chance for the trials of fire to test my weak and ailing flesh. N tried to sleep on the floor in both the security area in the Iqaluit airport, and in a hallway in an Ottawa mall. Above are some stranger’s feet. It was weird. The one big blessing is that she slept on the plane. Hurrah! And then got herself positively coated in pasta sauce. We got to spend a little more visiting time with our hosts in Ottawa, which was nice, though we were still too tired and rushed to be good company. Then this time, thanks to errands in town, and two trips to the Ottawa airport to attempt recovery of a missing glove (it was a handknit glove made and designed by me, with yarn we couldn’t even get again, so it was worth it), the 8 hour drive home took 16 hours. We pulled into our street spot in front of our house around 1:15 on Tuesday morning. We’ve spent the intervening days drinking a lot of tea, doing a ton of laundry, catching up on administrative emergencies, and taking enough naps to keep body and soul together, during the demands of a normal work week. I’ve turned the corner on my illness, I hope, though N seems to have contracted something additional. Our Christmas tree is down, the suitcases are put away, and I cooked an actual meal and enjoyed it. We gave a presentation on our trip at church this morning, have another one scheduled for school on Tuesday, and have started communicating with the powers-that-be about what might be next for us. The short transition is over, and the long transition begins. I’ll keep you posted when there’s something to post. In the meantime, thanks for reading and praying along on our journey. We’ll now be back to our regularly scheduled program of blathering about wool and vegetables.